Dazzling, celebrity owned Brentwood compound, recently renovated with exquisite details throughout. Estate is surrounded by walls and mature landscaping, providing the ultimate privacy and security. The main house has 3 bedrooms and 3.5 baths and has been elegantly updated with the finest touches. Soaring ceilings, formal living room with custom library loft. 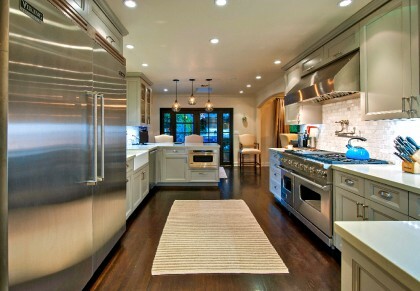 Large, professional, eat-in chef's kitchen invites all to experience California's relaxed lifestyle. Outdoor area is an expansive and gorgeous oasis. Sparkling pool and spa; outdoor stainless kitchen, sprawling grassy yard with professional "Farmscape" garden and an array of assorted fruit trees. Property includes a large, 2-story guesthouse, also beautifully renovated with separate gated entrance. Current owners have spared no expense seeking perfection and have created the ultimate family home and entertainer's paradise.